Blockade was a project created as a result of an Independent Study Unit project in my grade 11 Communications Technology class. 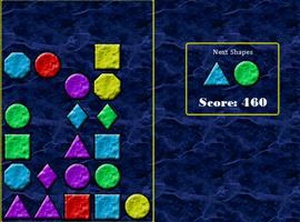 The idea spawned from the basic mechanics of Tetris, and evolved into a structure where the object is to match blocks of the same shape and/or colour in a horizontal or vertical row of three blocks. Blockade won first place in the Interactive Game category of the '09 Cawthra Animation Festival.